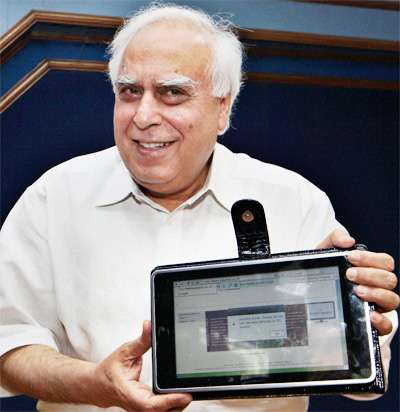 India's low cost $35 Android tablet is to be launched on October 5. Indian HRD minister Kapil Sibal said at a function that the tablet will be going to be launched soon next month. "This is not just a dream, it is a reality. The computer will bring in immense benefits to the students and will be connected to the net and perform all the functions that any other computer can perform." This tablet was first announced in July 2010 and since then it has gone through repeated delays and production problems. The name of the tablet will be announced at Launch on October 5. A look at its specifications: 7" touch screen with resolution of 800×480, 2 GB RAM, wi-fi connectivity, a USB port, an SD card slot, a video out, headphone jack, a sim card slot, 32 GB hard drive and a solar power option. The tablet will come pre-installed with Internet browsers, a PDF reader, video conferencing tools, open office, sci-lab, a media player, remote device management tools, multimedia input-output interface options etc. Some websites have reported that the tablet will have out of the box support for running custom Linux OS but there is no way to confirm it unless we wait for the launch and get a hands-on. Lets just hope it does not get delayed once again.